It must be one of Murphy's laws, that if you build a new windmill, the wind won't blow for a month. Actually, here in Maine we get a decent amount of wind but summer is probably the least windy of all the seasons. 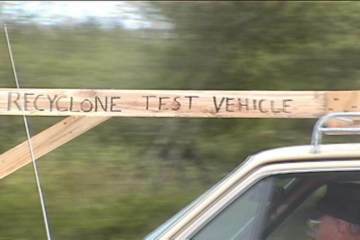 Enter the ReCyclone test vehicle. After 400,000+ miles of service it deserved a break anyway. 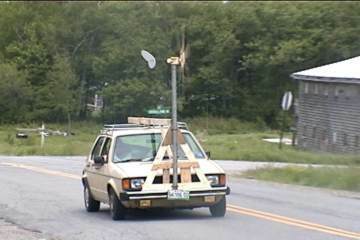 I wonder how many people have seen us driving up and down the road in it and thought the windmill was powering the car. 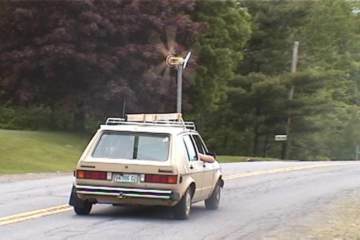 Testing the furl wind speed of my 40" genny. We can also test the electrical output from inside the car with our test box, and multimeter. This is probably not the most scientific method but it seems to work. We spin a generator/alternator at a given speed and load it with the light bulbs.. adding bulbs until the energy drops below our target voltage. 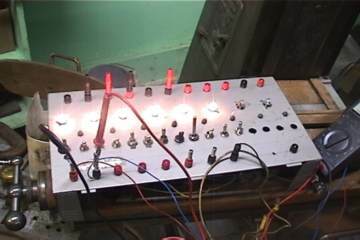 We measure the amperage and multiply by the voltage and get our output in watts. The lights in the picture are 12 volt/approx. 1 amp. 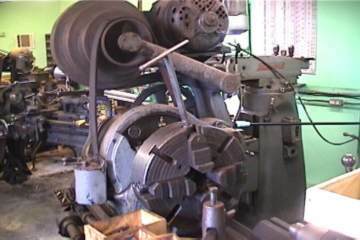 In the other picture, Dad is using a milling machine to spin the generator. 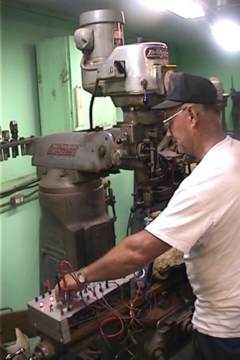 The Bridgeport makes it easier because we can adjust the rpm as needed. 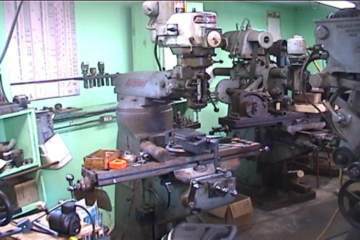 Also in the metal shop are 2 other milling machines, 2 lathes, a surface grinder and 4-head drill press. 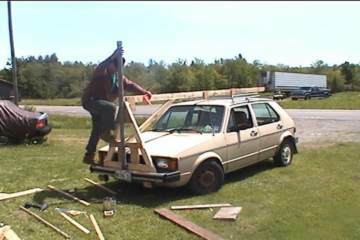 I am more at home in the woodshop, but I can see the limits of wood (except for blades) as I work on bigger windmills. The small windmills we've made are just for fun, lighting up a few small lights and giving us a chance to test different ideas that we will later use on a large scale windmill.